↑ "BBC's History of the Colosseum p. 2". Bbc.co.uk. 22 March 2011. Retrieved 16 April 2012. ↑ ୪.୦ ୪.୧ ୪.୨ ୪.୩ ୪.୪ ୪.୫ Roth, Leland M. (1993). Understanding Architecture: Its Elements, History and Meaning (First ed.). Boulder, CO: Westview Press. ISBN 0-06-430158-3. ↑ ୯.୦ ୯.୧ "Frommer's Events – Event Guide: Good Friday Procession in Rome (Palatine Hill, Italy)". Frommer's. Archived from the original on 7 January 2009. Retrieved 8 April 2008. ↑ Logan, Willy. "The Flavian Dynasty". Archived from the original on 31 May 2011. Retrieved 25 September 2007. ↑ J. C. Edmondson; Steve Mason; J. B. Rives (2005). Flavius Josephus and Flavian Rome. Oxford University Press. p. 114. ISBN 0-19-926212-8. 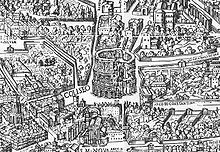 ↑ "The Colosseum – History 1". Retrieved 26 January 2008. ↑ "The Coliseum". The Catholic Encyclopedia. New Advent. Retrieved 2 August 2006. ; the form quoted from the Pseudo-Bede is that printed in Migne, Pat. Lat 94 (Paris), 1862:543, noted in F. Schneider, Rom und Romgedanke im Mittelalter (Munich) 1926:66f, 251, and in Roberto Weiss, The Renaissance Discovery of Classical Antiquity (Oxford:Blackwell) 1973:8 and note 5. ↑ ୧୫.୦୦ ୧୫.୦୧ ୧୫.୦୨ ୧୫.୦୩ ୧୫.୦୪ ୧୫.୦୫ ୧୫.୦୬ ୧୫.୦୭ ୧୫.୦୮ ୧୫.୦୯ ୧୫.୧୦ ୧୫.୧୧ ୧୫.୧୨ ୧୫.୧୩ Claridge, Amanda (1998). 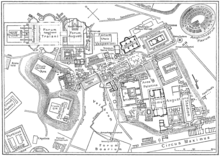 Rome: An Oxford Archaeological Guide (First ed.). Oxford, UK: Oxford University Press, 1998. pp. 276–282. ISBN 0-19-288003-9. 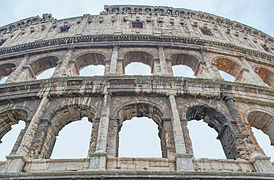 ↑ ୧୬.୦ ୧୬.୧ ୧୬.୨ "Building the Colosseum". tribunesandtriumphs.org. ↑ ALFÖLDY, GÉZA (1995). 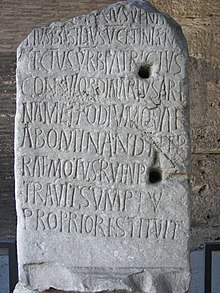 "Eine Bauinschrift Aus Dem Colosseum". Zeitschrift für Papyrologie und Epigraphik. 109: 195–226. ↑ The repairs of the damages inflicted by the earthquake of 484 were paid for by the Consul Decius Marius Venantius Basilius, who put two inscriptions to celebrate his works (ଛାଞ୍ଚ:CIL). 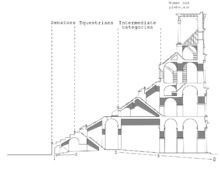 ↑ "MEDIVM AEVVM". The-Colosseum. The-Colosseum.Net. Retrieved 1 November 2016. ↑ Young, Gayle (24 February 2000). "On Italy's passionate opposition to death penalty". CNN. Retrieved 2 August 2006. 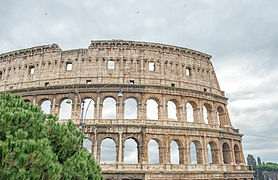 ↑ "INTERNATIONAL: Roman Colosseum Lit to Mark Connecticut's Abolition of Death Penalty". Death Penalty Info. Retrieved 9 June 2015. 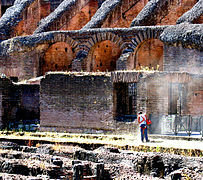 ↑ Colosseum stages peace concert, BBC News Online, 12 May 2002. ↑ McCartney rocks the Colosseum, BBC News Online, 12 May 2003. ↑ Sir Elton's free gig thrills Rome, BBC News Online, 4 September 2005. ↑ Downey, Charles T. (9 February 2005). "The Colosseum Was a Skydome?". Retrieved 2 August 2006. ↑ Samuel Ball Platner (as completed and revised by Thomas Ashby), A Topographical Dictionary of Ancient Rome. Oxford University Press, 1929. ↑ The Colosseum.net : The resourceful site on the Colosseum. ↑ Squires, Nick (23 June 2010). 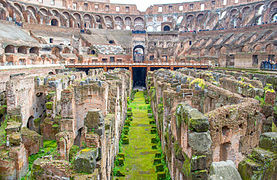 "Colosseum to open gladiator passageways for first time". The Daily Telegraph. UK. Retrieved 30 January 2011. ↑ Joseph M Champlin, The Stations of the Cross With Pope John Paul II Liguori Publications, 1994, ISBN 0-89243-679-4. 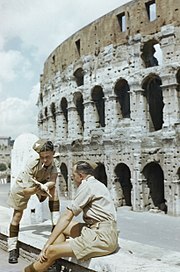 ↑ "Rome Colosseum repair to be funded by Tods shoe firm". BBC. 21 January 2011. Retrieved 16 April 2012. ↑ Silvers, Eric (25 April 2014). "The Colosseum's Badly Needed Bath". Wall Street Journal. Retrieved 7 September 2014. 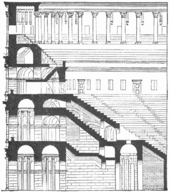 ↑ "CATHOLIC ENCYCLOPEDIA: The Coliseum". newadvent.org. ↑ "Colosseum & Christian Martyrs". tribunesandtriumphs.org. ↑ Brockman, Norbert C. (13 September 2011). Encyclopedia of Sacred Places [2 volumes]. ABC-CLIO. p. 108. ISBN 9781598846553. 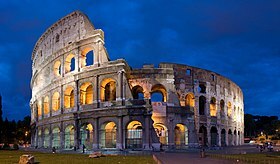 Public executions were held there during the empire, and it is for these last events that the Colosseum became a Christian shrine. 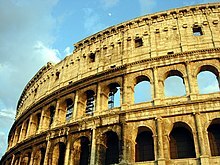 It is disputed whether many early Christian martyrs actually died in the Colosseum, since there is no mention of that in ancient Christian records. ↑ Brockman, Norbert C. (13 September 2011). Encyclopedia of Sacred Places [2 volumes]. ABC-CLIO. p. 108. ISBN 9781598846553. There seems little doubt that some Christians were executed as common criminals in the Colosseum-their crime being refusal to reverence the Roman gods. Most martyrs, however, died for their faith at the Circus Maximus. Some were even executed as members of what the Romans considered a Jewish sect, since both Jews and Christians refused to reverence the gods. ↑ Potter, David Stone (1999). Life, Death, and Entertainment in the Roman Empire. University of Michigan Press. p. 227. ISBN 9780472085682. Retrieved 30 April 2014. The public execution of condemned offenders, including Christians, is associated above all with the amphitheater, although there were executions at various other venues. Gladiatorial games, hunting displays, and executions also took place at the Circus Maximus, even after the construction of the Colosseum (Humphrey 1987, 121). ↑ Hopkins, p. 103: "It is likely that Christians were put to death there and that those said to have been martyred 'in Rome' actually died in the Colosseum. But, despite what we are often told, that is only a guess. One of the possible candidates for martyrdom in the Colosseum is St. Ignatius, a bishop of Antioch (in Syria) at the beginning of the second century AD, who was 'condemned to the beasts' at Rome." ↑ Brockman, Norbert C. (13 September 2011). Encyclopedia of Sacred Places [2 volumes]. ABC-CLIO. p. 108. ISBN 9781598846553. The Christians who did die in the Colosseum often did so under dramatic circumstances, thus cementing the legend. The hero St. Ignatius of Antioch, a disciple of St. John the Beloved, was sent to the beasts by Trajan in 107. Shortly after, 115 Christians were killed by archers. When Christians refused to pray to the gods for the end of a plague in the latter part of the second century, Marcus Aurelius had thousands killed in the Colosseum for blasphemy. ↑ Hopkins, p. 160: "For most of the Middle Ages and early Renaissance the Colosseum was not so much a monument as a quarry. To describe this activity as 'robbery' is to give the wrong impression. For the most part, there was nothing illegal or unofficial about the removal of this stone." ↑ "The Coliseum". Catholic Encyclopedia. New Advent. Retrieved 24 April 2014. 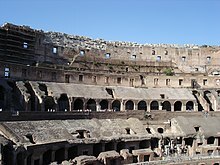 In the Middle Ages, for example, when the sanctuaries of the martyrs were looked upon with so great veneration, the Coliseum was completely neglected; its name never occurs in the itineraries, or guide-books, compiler for the use of pilgrims to the Eternal City. ↑ "The Coliseum". Catholic Encyclopedia. New Advent. Retrieved 24 April 2014. 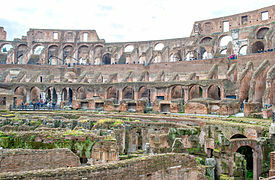 The "Mirabilia Romae", the first manuscripts of which date from the twelfth century, cites among the places mentioned in the "Passions" of the martyrs the Circus Flaminius ad pontem Judaeorum, but in this sense makes no allusion to the Coliseum. ↑ "The Coliseum". Catholic Encyclopedia. New Advent. Retrieved 24 April 2014. Pope St. Pius (1566-72) is said to have recommended persons desirous of obtaining relics to procure some sand from the arena of the Coliseum, which, the pope declared, was impregnated with the blood of martyrs. The opinion of the saintly pontiff, however, does not seem to have been shared by his contemporaries. ↑ "The Coliseum". Catholic Encyclopedia. New Advent. Retrieved 24 April 2014. 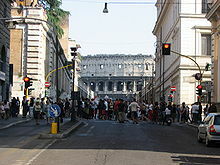 The pamphlet was so completely successful that four years later, the jubilee year of 1675, the exterior arcades were closed by order of Clement X; from this time the Coliseum became a sanctuary. ↑ ୫୩.୦ ୫୩.୧ "The Coliseum". Catholic Encyclopedia. New Advent. Retrieved 24 April 2014. 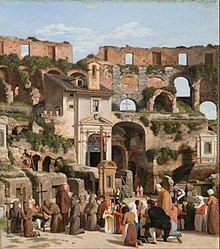 At the instance of St. Leonard of Port Maurice, Benedict XIV (1740-58) erected Stations of the Cross in the Coliseum, which remained until February, 1874, when they were removed by order of Commendatore Rosa. St. Benedict Joseph Labre (d. 1783) passed a life of austere devotion, living on alms, within the walls of the Coliseum. ↑ Litfin, Bryan M. (1 October 2007). Getting to Know the Church Fathers: An Evangelical Introduction. Brazos Press. p. 44. ISBN 9781441200747. But according to Irenaeus (who spent time in Rome not long after these events took place) Ignatius did in fact meet his end by being torn apart by wild animals for the amusement of the Roman masses, probably in the infamous Colosseum. The crowd there that day would have viewed the spectacle as a crushing defeat of this meek man's Christian religion. But Ignatius understood his death to be a shout of victory. 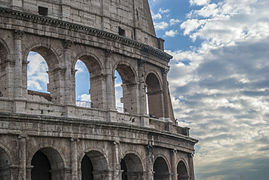 Today a Christian cross stands in the Colosseum of Rome with a plaque that reads, "The amphitheater, one consecrated to triumphs, entertainments, and the impious worship of pagan gods, is now dedicated to the sufferings of the martyrs purified from impious superstitions." ↑ Cooper, Paul (5 December 2017). "Rome's Colosseum Was Once a Wild, Tangled Garden". The Atlantic. Retrieved 12 January 2018. "କୋଲୋଜିୟମ୍" . The New Student's Reference Work . Chicago: F. E. Compton and Co. 1914.